"The Upper Delaware" Fall/Winter 2018 Newsletter Available - Upper Delaware Council, Inc. 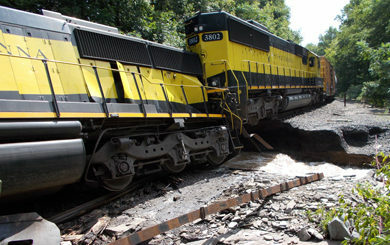 Featured articles include: “Train Derailment Dumps Diesel into River, Raises Emergency Concerns”; “Rising Nation Journey Down the Lenape Sipu”; “NY-PA Bridges Advance to Fall Openings”; “The Future of Upper Delaware Storytelling”; “Hydraulic Fracturing Regulations Still in Works”, “Acid Factories Contributed to Valley Economy”; “Upper Delaware Scenic Byway Welcomes Town of Hancock”; “In Memoriam: George R. Rosenberger”; and more. To view the newsletter on-line, visit https://www.upperdelawarecouncil.org/wp-content/uploads/UDC_2018_FallWinter_Newsletter.pdf.